IMPORTANT: If you haven't already done so, you may want to review the INTRODUCTORY NOTES on the storyline, controls, treasures/relics and saving/checkpoints. These appear at the start of the PROLOGUE walkthrough. As always, I highly recommend that you do not rely exclusively on the autosave. Instead be sure to save manually at least once or twice each level. Then, if you miss something or run into a bug, you can reload rather than having to replay the entire level. Many common bugs are documented in this walkthrough. They are in hot pink text, like this, so they're easy to spot. I have also included an overview of major bugs without game spoilers. However, not every potential problem is covered here. So be safe; save often in new slots. In case you need them, Underworld Save Files for PC, PS3 and Wii are available. BOARDING AMANDA'S SHIP: You regain control of Lara after she pulls her boat alongside Amanda's ship, the Megaera. * Jump from the deck of Lara's boat to grab the big ship's anchor. Climb up to grab the chain. Continue climbing to the top. Then jump up four times to reach the deck above. 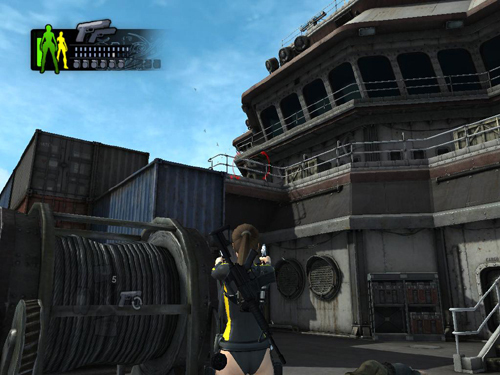 Now stay under cover behind the crates as you scope out the situation: There are no enemies in the section where Lara is standing, but 3 mercenaries patrol the deck below and there's a fourth man on the upper deck looking down over the stacked containers. You can probably get the first man (below on the left) from where you start using only pistols, as long as you stay behind the crates. Then you'll need to venture downstairs to confront the others. Try and keep some distance between you and the mercenaries, and keep firing as you strafe back and forth to dodge their fire. If you find yourself in close combat, try kicking (Interact) to knock the bad guy off his feet. Or, better yet, a flying jump-kick (run toward the enemy then press Interact) Then shoot him while he's down. Note that the small fuel tanks will explode if you shoot them, causing extra damage if an enemy is standing nearby. But keep in mind that the mercs can do the same. So don't stand too close to a tank if you're under fire. When you've killed the 3 men on the deck, head toward the right side of the ship (while facing the stern) and use the cable spool for cover to take down the guy on the upper deck (as shown in this screenshot). You can use pistols for this to conserve ammo, since the spool offers protection. NOTE: In case you haven't already made the connection, the cargo offers a clue as to what may actually be going on. As in the final level of Tomb Raider: Legend, a number of the crates and containers here are stenciled with the word "NATLA". Apparently there's a link between two of Lara's old enemies. XBOX 360 ACHIEVEMENT/PLAYSTATION 3 TROPHY: To unlock the Swan Diver II achievement/trophy, upon reaching the upper deck, go to the left and locate the white bin with the words "Life Jackets" stenciled on it. (These screenshots show the exact spot.) Swan dive off the box into the sea below. Note that in order to unlock all three Swan Diver achievements, you must dive from the three highest points in the game (over water) during the same play-through. For more info, follow these links to the Xbox 360 Achievements and PS3 Trophies pages. HELIPAD: This area is well guarded. Three men stand between you and the choppers, 2 more mercenaries guard the helipad area, and there's another pair of men (7 in all) stationed behind the helicopters. If you advance carefully, you can use the crates in the side hallways for cover—at least until the mercenaries shoot them to bits. Then you'll need to run out and confront any remaining enemies. You can use the Target Lock key to keep an enemy in your sights even if he ducks behind cover. But if you want to switch targets, you'll have to release the Target Lock button, aim the camera toward another enemy and lock on again. Otherwise, combat can get a little difficult, with Lara tracking one enemy while another sneaks up beside her. When the coast is clear, pick up 2 more first aid kits. The first is located on the deck with the big, circular vent, near the top of the right-side stairs leading down to the helipad. The other is on the deck near the crates beside the second helicopter. Make your way down to the aft deck, behind and below the helipad, using the stairs on either side. Go carefully since 3 more mercenaries wait below—2 in plain sight, the other just inside the doorway at the back of the boat. There's also another first aid kit on the floor near the doors. BELOWDECKS: When the coast is clear, go through the doorway and down the stairs. The door at the bottom opens as you approach. There are 2 enemies inside the next room on the right. Soften them up with a grenade, then go in and finish the job. Continue downward into lower decks of the ship. The door at the bottom of the next flight of stairs also opens automatically. Proceed forward to the engine room. Cinematic: The lead mercenary gets the drop on Lara. She dodges out of the way but finds she's taken cover behind a fuel pipe. She quickly dives out of the way as the conduit explodes, killing the soldier and setting off a nasty chain reaction. Cinematic: Lara peers into the next room and sees Amanda standing on a glassed-in observation deck. She's holding the gauntlet device that her men stole from Lara. "Damn," she curses. "It's too small." A familiar voice replies, "Only Lara can use it now." "Until I kill her," Amanda snaps. "Even that won't unbind the artifact," the other voice replies. Amanda then learns that the ship is taking on water. So she leaves the conversation unfinished to attend to the immediate danger. Once Amanda has gone, Lara enters the room to find her old nemesis, Jacqueline Natla, encased in a huge glass cylinder. "I'm very pleased to see you again, Lara," she says, despite having her back toward the door where Lara enters. In the ensuing conversation, Lara learns that Amanda has been holding Natla in this giant specimen jar, and it was apparently Natla who told Amanda about the existence of Avalon. Even in captivity, Natla seems calm and patient. She's taken some enjoyment in watching Amanda's suffering. When Lara asks about her mother, Natla answers that the dais Lara found in Nepal [in TR: Legend] is actually part of a travel network. She tells Lara that while searching for Avalon, her father accidentally discovered Niflheim instead. But, in truth, Natla believes Amelia Croft did not end up in Avalon but in Helheim, another Norse underworld. Lara demands to know where Helheim is. Natla says she'll tell her one day, but when that day comes, Lara will need Thor's hammer to enter. Natla taunts Lara a bit, saying maybe she'll have better luck finding the hammer than her father did. Lara demands to know more, but Natla provides only a cryptic reference to the coast of Thailand before one of Amanda's helicopters lifts her glass prison out of the hold and carries her off. †UPDATE HISTORY: 11/24/08 - First draft of walkthrough posted online. 12/30/08 - Added Xbox 360 Swan Diver II achievement location. 3/23/09 - Fixed a few typos and made several small changes for clarity and accuracy, no major strategy changes though. *FYI: Along with her sisters Alecto and Tisiphone, Megaera is one of the three Furies (or Erinyes) in Greek mythology. She is associated with envy, jealousy and resentment, and was said to pursue and punish the guilty, especially adulterers. Copyright © 2008- - Stellalune (). All rights reserved. The screenshots and videos included here were made using Fraps. Feel free to copy or print this walkthrough for personal use. By all means, share it with friends, but please include this credit line so people can send me their feedback. No part of this walkthrough may be reproduced on another site without permission.